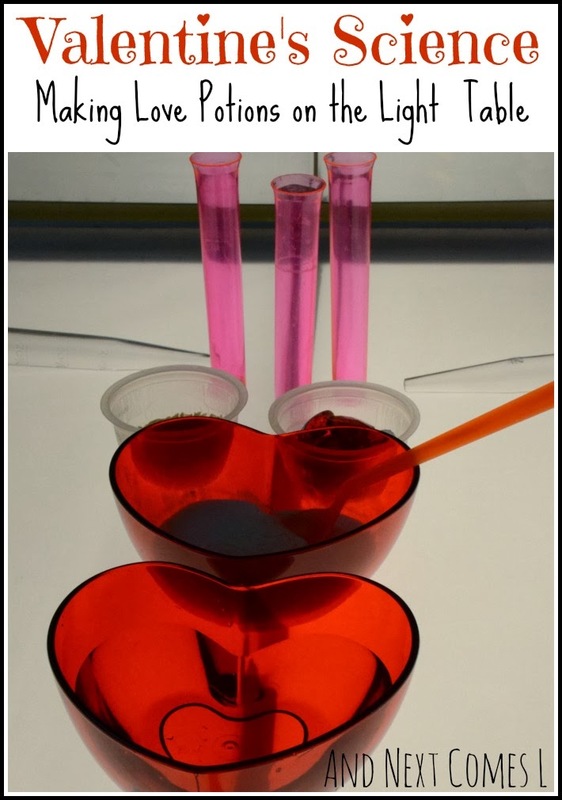 To celebrate Valentine's Day, I set up this invitation to make some love potions on the light table. It's your typical baking soda and vinegar combination, but since we have yet to get really messy on our light table, this invitation was a huge step for me. I fear ruining our light table. As a result, I have been hesitant to do anything messy up until now, despite knowing that we waterproofed our light table. To ease my discomfort with mess on the light table, I made sure to include plastic containers with high sides to hopefully contain the mess. Anyway, what I presented to the boys was a huge hit. They could not get enough. To set up this invitation, I set out two red heart shaped bowls. One contained baking soda and one contained vinegar with red food coloring. I also included two turkey basters, two plastic containers, and some pink tube shots. Love potions wouldn't be complete without some special extras so I included a bowl of white rice and a bowl of red heart jewels. All of these items were found at the dollar store. So many fine motor skills are at work with this activity as the boys scooped, squeezed the basters, and sprinkled white rice. The boys, however, were most interested in the turkey basters. They spent a lot of time transferring vinegar from the heart bowl into the pink tube shots and/or the clear applesauce containers that previously held the rice and heart jewels. Although love potions could easily be made off the light table, there's just something so magical about the bubbling scientific reactions on the light table. And here's a close up of J's hearty love potion. Days after we did this activity, Still Playing School posted a lovely Love Potions Color Mixing Activity on the Light Table. It's worth trying out too!